The Spotify version of the album instead opens with Celine Dion's "How Does a Moment Last Forever", followed by Ariana Grande and John Legend's "Beauty and the Beast", and Josh Groban's "Evermore", with the rest of the songs in the same order. The album debuted at No. 3 on the Billboard 200 chart with 57,000 units, 48,000 of which are traditional album sales. It has sold 337,000 copies in the United States as of July 2017. ^ a b Coggan, Devan (January 19, 2017). "Cline Dion to perform new song for live-action Beauty and the Beast". Entertainment Weekly. Retrieved January 26, 2016. ^ "Beauty and the Beast (Original Motion Picture Soundtrack/Deluxe Edition)". Spotify. Retrieved 29 April 2018. ^ Caulfield, Keith (March 19, 2017). "Ed Sheeran's 'Divide' Spends Second Week at No. 1 on Billboard 200, 'Beauty and the Beast' Debuts at No. 3". Billboard. ^ Caulfield, Keith (July 4, 2017). "Kendrick Lamar's 'DAMN.' & Ed Sheeran's 'Shape of You' Lead Nielsen Music's Mid-Year 2017 Charts". Billboard. Retrieved 4 July 2017. ^ "Australiancharts.com – Soundtrack – Beauty and the Beast %5B2017%5D". Hung Medien. Retrieved April 1, 2017. ^ "Austriancharts.at – Soundtrack – Die Schöne und das Biest %5B2017%5D" (in German). Hung Medien. Retrieved March 29, 2017. ^ "Ultratop.be – Soundtrack – Beauty and the Beast %5B2017%5D" (in Dutch). Hung Medien. Retrieved March 18, 2017. ^ "Ultratop.be – Soundtrack – Beauty and the Beast %5B2017%5D" (in French). Hung Medien. Retrieved December 12, 2017. ^ "On The Charts...This Week". FYIMusicNews. Retrieved March 21, 2017. ^ "Danishcharts.dk – Soundtrack – Beauty and the Beast %5B2017%5D". Hung Medien. Retrieved March 29, 2017. ^ "Dutchcharts.nl – Soundtrack – Beauty and the Beast %5B2017%5D" (in Dutch). Hung Medien. Retrieved December 12, 2017. ^ "Elokuvamusiikkia: Beauty And The Beast (Original Motion Picture Soundtrack)" (in Finnish). Musiikkituottajat – IFPI Finland. Retrieved April 2, 2017. ^ "Irish-charts.com – Discography Soundtrack". Hung Medien. Retrieved April 21, 2017. ^ "'Beauty and the Beast (O.S.T.)' on the FIMI charts" (in Italian). Federazione Industria Musicale Italiana. Retrieved April 6, 2018. ^ "Top Album - Semanal (del 24 de Marzo al 30 de Marzo)" (in Spanish). Asociación Mexicana de Productores de Fonogramas y Videogramas. Archived from the original on April 26, 2017. Retrieved April 26, 2017. ^ "Charts.org.nz – Soundtrack – Beauty and the Beast %5B2017%5D". Hung Medien. Retrieved April 7, 2017. ^ "Norwegiancharts.com – Soundtrack – Beauty and the Beast %5B2017%5D". Hung Medien. Retrieved April 1, 2017. ^ "Oficjalna lista sprzedaży :: OLiS - Official Retail Sales Chart". OLiS. Polish Society of the Phonographic Industry. Retrieved March 30, 2017. ^ "Official Scottish Albums Chart Top 100". Official Charts Company. Retrieved March 25, 2017. ^ "2017년 10주차 Album Chart" (in Korean). Gaon Music Chart. Retrieved March 18, 2017. ^ "2017년 12주차 Album Chart" (in Korean). Gaon Music Chart. Retrieved April 8, 2017. 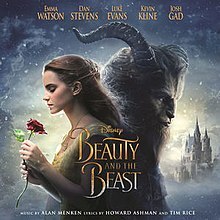 ^ "Spanishcharts.com – Soundtrack – Beauty and the Beast %5B2017%5D". Hung Medien. Retrieved December 12, 2017. ^ "Swisscharts.com – Soundtrack – Beauty and the Beast %5B2017%5D". Hung Medien. Retrieved March 29, 2017. ^ "Official Albums Chart Top 100". Official Charts Company. Retrieved March 25, 2017. ^ "Official Soundtrack Albums Chart Top 50". Official Charts Company. Retrieved March 18, 2017. ^ "Ed Sheeran's 'Divide' Spends Second Week at No. 1 on Billboard 200, 'Beauty and the Beast' Debuts at No. 3". Billboard. Retrieved March 20, 2017. ^ "Soundtrack Albums: The Week of April 1, 2017". Billboard. Retrieved March 21, 2017. ^ "Jaaroverzichten 2017: Albums" (in Dutch). Ultratop Flanders. Retrieved August 6, 2018. ^ "Rapports Annuels 2017: Albums" (in French). Ultratop Wallonia. Retrieved August 6, 2018. ^ "Kid Albums – Year-End 2017". Billboard. Retrieved August 6, 2018. ^ "British album certifications – Motion Picture Cast Recording – Beauty and the Beast". British Phonographic Industry. Select albums in the Format field. Select Silver in the Certification field. Type Beauty and the Beast in the "Search BPI Awards" field and then press Enter.